My current favourite summer trend - Maxis!! Its April - which means in Mumbai it's hot, correction hot and humid, correction unbearably hot and humid..the saving grace is that for most of the day I am in my air conditioned office premises but when I'm travelling I just can't stop thinking about how hot it is..so cotton airy clothes are currently my best friends.. I can't even think about getting close to denims.. and when it comes to non office wear Maxis are what I am really looking forward to buy..I mean one can always wear knee length flowy dresses to beat the heat. But Maxis are so in trend right now and although they are long but quite airy and soo comfortable. And it's not just maxi dresses but maxi skirts and maxi pants (palazzo pants.. but i like caling them maxi pants) are in too.. Here are some pictures of how celebrities here and abroad are wearing them.. Take a look for some inspiration to look cool, casual and breeze through this summer..
Anita Dongre's Summer Resort collection. Pretty pastels! Kim K shows off some leg in a Maxi skirt too..
Blake Lively's power pink pants look classy and formal! So where does one buy them? Amritsar has an airport and a railway station. So getting into the city is pretty easy. We stayed at the Radisson Blu. There are many budget stay options in the city which are very close to the city centre and the Golden Temple. However, since Radisson Blu is a new property in Amritsar the rooms were reasonably priced at Rs 5500 + taxes, thus we didn't mind spending. The hotel is very close to the airport but a good 30km away from the city. The property though is beautiful and the rooms definitely match up to the Radisson tag. On arrival we were served a welcome drink. The rep at their service desk was sweet enough to offer a late check out even without us asking for one. They offered us a 2 hour extension on the check out time, which was really helpful. Since, the hotel is newly built, the gym and spa are not fully functional. It has a lounge and a restaurant.The room rates are inclusive of breakfast. The buffet breakfast spread was huge and everything was delicious and filling. The staff was very courteous, polite and always smiling. They all greet you with "Sasriyakal!" There was only one reason for our visit to Amritsar - The Golden Temple! There is something about these heritage structures of India that no picture no matter how well taken can capture their true beauty. I was advised to visit the temple twice, once during the day and once to check out the night view. And it looks different both the times. We were lucky enough to have gone there on a full moon night. The temple was shining or was it glowing in full glory. If you have time on your hands please do not miss the langar ( Meal offered inside the temple). Unfortunately we couldn't make it at both the times. Wagah Border - The border that separates Amritsar and Lahore, India and Pakistan is a must visit. The ceremony starts just before sunset where the flags of both the nations are lowered and where the army men from across the borders shake hands. The ceremony is an hour long but please please ensure that you do not go on a public holiday or the weekend. Since, there are no entry fees, this place gets crowded easily and since we went on a public holiday we had abosultely no place to sit. Jalianwala Baug - The place where hundreds of Indians were fired at by a British officer and his team. Their fault being that they had gathered here to plan a revolt. The Indian government has turned this plot into a memorial for these Indians who lost their lives here. One can still see the bullet marks all over the walls. The number of bullets fired were in thousands. This bit of revisiting history outside the textbook really unnerved me. Shop for Phulkaris and Amritsari Jootis - There are lots and lots of markets in Amritsar selling local garments and jootis. I wanted to buy a phulkari since a long time and I fulfilled my wish in Amritsar. A short walk away from the golden temple is Katra Jaimal Singh Bazaar which has lots of phulkari dupatta shops. One can easily bargain and the dupattas range anything from 300 to 3000 depending on how heavy the embroidery is. I don't have a picture of the one I bought but it looks exactly like the one in the picture below. I am planning to pair it with a fuschia salwar. what say? When in Punjab, stop counting calories! Just stop thinking about how oily, buttery sugary your food is. Just let go and binge binge binge! Kesar da Dhaba is the must go is what I have heard. We figured out where the place is, left for the place, reached there only to see there was waiting for an hour or so. Yes! this place is that popular! so we left from there Yes trip is about a lot of unfortunate incidences :( We went to the neighbouring Bharwan da dhaba, which was not such a good decision. The food was all of the above but not tasty. So I wouldnt recommend it to any one. But before reaching Amritsar, we had a stopover at a Dhaba on the highway. It was an actual one. And the food was so warm and fresh. Really enjoyed eating there. Here's something to tempt you while I go burn some calories! Have you been to Amritsar? How did you find the city? I am a spa junkie. I love spas.My friends often joke about my spa obsession saying that whichever place I travel to I only look for a spa there. 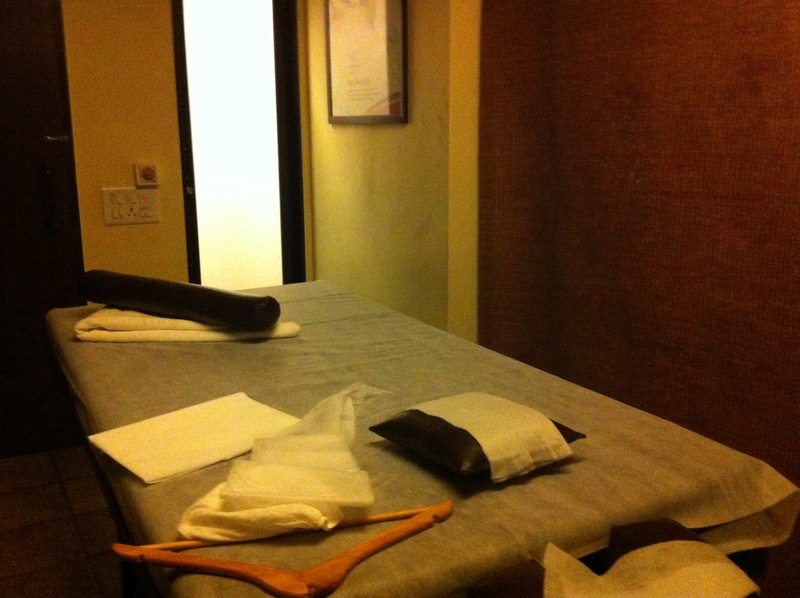 I've tried out quite a few Spas in Mumbai and the latest that I added to my list is the Four Fountains Spa. They have positioned themselves as affordable day spas and have over 17 spas spread across 8 cities. You can check their website here. On the day of the appointment I received a call from their staff to confirm the same and also to inform me that I should reach 15 minutes prior to the scheduled time. On reaching their I was greeted and seated by their executive. 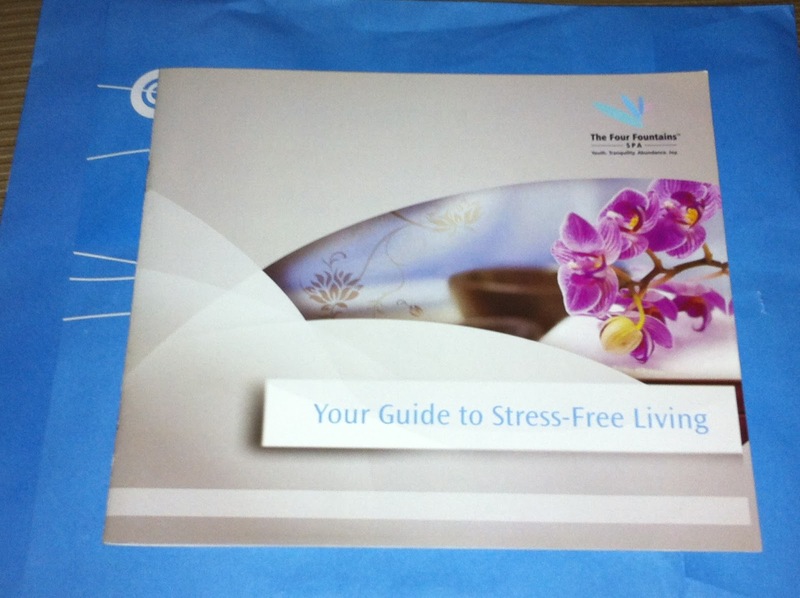 She informed me they have 4 types of spas Detoxing, Destressing, Immunity (?) and Beauty. I told her i was looking at a body massage therapy. And just randomly chose the Aromatherapy Radiating Massage (Rs 2099) after glancing through their menu. The menu was elaborate and there were a list of services under each head including not just massages but scubs, wraps and facials. While glancing through the menu I checked the prices. Although, they claim to be affordable I found their prices almost on par with the other Spas I have tried. Also I noticed that the Aromatherapy Massage was mentioned under 2 under heads as well. On enquiring about the difference I was told that while the technique is the same the aromatherapy oil used is different depending on what therapy one selects. Since I had chosen the one under the "Beauty" the oil used for me was almond, jojoba oil. After having chosen the therapy, I was greeted by their in house doctor who took a mini stress test of mine and told me that my stress level is medium and I should be taking a spa every 21 days (was I happy to hear this). She also asked me if there are specific areas that pain a lot. And she gave me a small prescription note to be handed over to my therapist asking her to focus on these areas. So I was then introduced to my therapist for the day Shanta, she escorted me to my spa room and asked me to change into the disposable clothes and put my valuables in a locker.The spa room was not the usual small, compact one but was quite big but basic. The decor of the room wasn't too spa like but functional. Here are some pictures of the room. The lighting in the room was pleasant. The room had an accompanying shower. Th therapy started with my therapist wiping my feet with hot towel. The massage experience was great. Some of the strokes were brilliant. And my therapist was sweet, polite and well trained. She knew exactly when to ask about the pressure, the temperature, the lighting. The oil used had nice, light fragrance. I was even given eyepads that were dipped in rose water that smelled like heaven. The music added to the experience and I was almost about to doze off when some drilling machine in a neighbouring room went on. It wasn't loud, but disturbing for sure. My therapist was really apologetic about it but obviously she couldnt help it. The room wasn't sound proof as I could hear vehicles and people talking intermittently. these disturbances aside, the therapy in itself was great and very relaxing.After the therapy I took a nice hot water shower that relaxed me even further. The oils were pretty effective. My skin felt nourished and soft. I was then served a shot of green tea and asked to fill a feedback form. 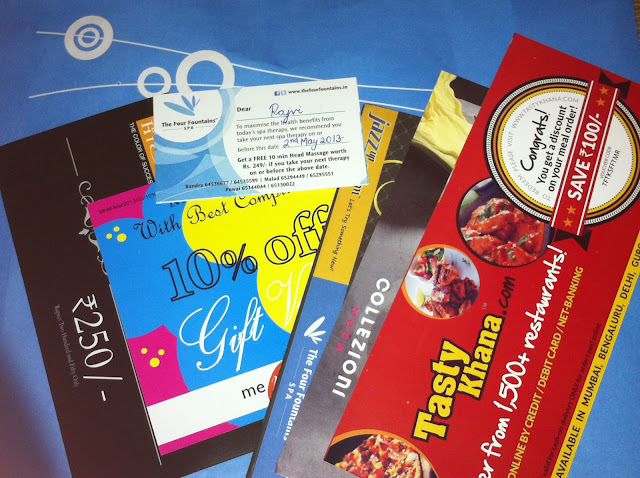 I gave my fedback and inreturn got a whole lot of discount vouchers and couponds from their affiliated salon and a couple of other places. And a book on stress and a relaxing gel that can be used to relax sore muscles. Steam should be included as a part of the massage. As I mentioned earlier, I have been to a lot of spas and a body massage is always accompanied with steam and shower. 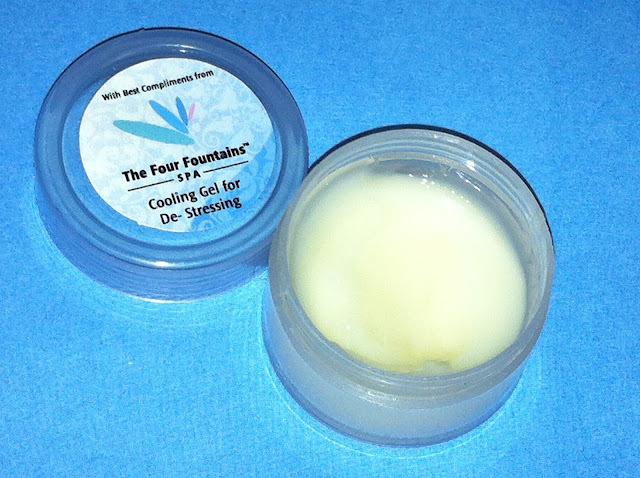 The steam helps the skin in absorbing the therapeutic oils applied. But here steam is charged for additionally. Disclaimer : The therapy I had taken was complimentary and offered to me by their marketing team. However, my opinions are completely unbiased. So what comes to your mind when someone you know says he\she is travelling to the NYC? Statue of liberty? Wall street? Empire state? Snow? Lots of shopping? I'm sure for a lot of girls like me the most spontaneous reaction would be - " If you don't mind, here's my shopping list" right? So recently, when my dad found out that hell be travelling to the US even before he announced his travel plans knowng his darling daughter he just said "hand me over your shopping list." Who can resist an offer like that now!! So I quickly went online checked out all the exclusive beauty products not available here in Mumbai and put them on my list. Here's what all I got from Sephora and Bath and Body woks (My favourite brand for fragrances) US. Here are all the products.. love! Still beaming!! :))) Thanks dad!! The last proper story I posted was almost a good 3 weeks back. A lot of things have been keeping me busy offlate. For once the whole of last week I was travelling up north. Which means there will be a lot of travel posts in the next couple of weeks. But as of now I am going to write about the Lakme Fashion week without further delay. This time I was lucky enough to get passes for the Lakme Fashion week Summer Resort 2013. If you know me well, you would know how much fashion excites me. I am an avid fashion blog reader and till now I have seen fashion weeks and ramp shows only in pictures. So this was something that I was really looking forward to. The passes entitled me to attend 2 shows Shehla Khan and Kunal Rawal. While I had some knowledge on Shehla Khan (she's a newbie and her designs are feminine and soft) Kunal Rawal being a men's wear designer did not hold much of my interest. Shehla Khan's collection was titled Boudoir. Karishma Kapoor the showstopper walks with the designer. How awesome does she look! Kunal Rawal with his showstoppers Arjun Kapoor and Shahid Kapoor. How hot do they look! Doing my own bit of posing! Lakme had set up a makeup booth, where one could get makeup and nails done. Loved the new pop tints! Overall loved the experience, the buzz, the media and photogs covering the event and ofcourse the fashion spotting. Infact IMHO the fashion spotting off the ramp was even better than the actual shows Looking forward to the next fashion week now.